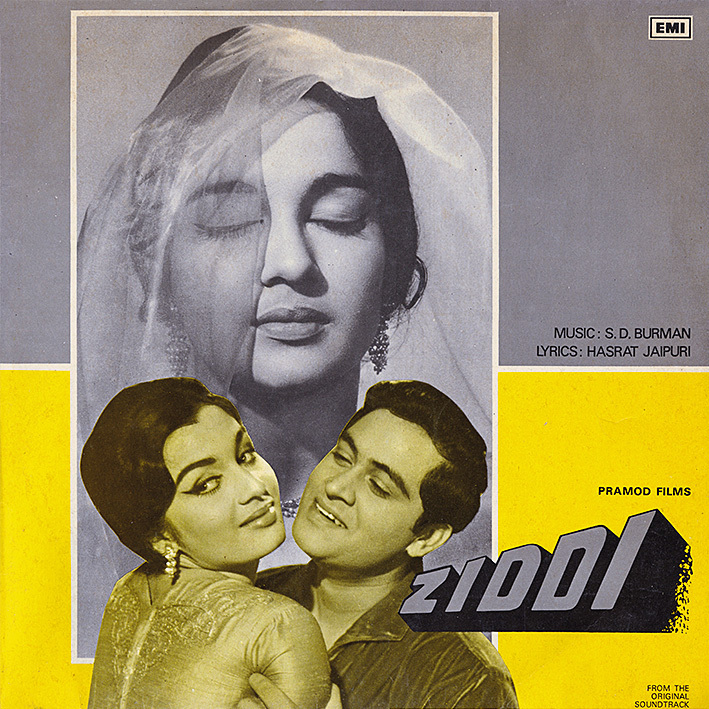 It's possible that a film review over at the Memsaab Story blog some years ago was what initially induced me to add 'Ziddi' to my soundtrack want list... "And the songs – my God, the songs! They are made of beautiful, all of them" certainly sounds like something that would have piqued my curiosity, and SD Burman assisted by his son Rahul Dev generally stands for quality. Truth be told though, having eventually acquired this LP I was left a bit disappointed. A tiny bit. Oh, it has its moments, my favourite of which are Lata's 'Yeh Meri Zindagi' and 'Raat Ka Samaan', both of them charming and hummable, and Rafi's 'Pyar Ki Manzil' is kind of cool... and I could easily put the record on as pleasant background music to whatever it is that I'm doing, but, despite the odd nifty instrumental detail, there wouldn't be much on it to stop me in my tracks. So basically it's good, but not outstanding. Thank you so much Mr.Pc for the best soundtrack composed by great S.D.Burman ji and i must say the sound quality is outstanding. Specially Pyar Ki Manzil , Teri Soorat Se Nahin Milti and Raat Ka Samaan are the highlight of the album. thank you for about the ten thousandth time. very much appreciate all of your efforts. Yes you were expecting too much PC, it is a unique Album different from usual S.D. Burman scores one of the reason great Laxmi Pyare were the arrangers in this album and song "Raat Ka Sama' was composed by S.D Burman but rest was arranged by Laxmi Pyare and S.D was not willing to add initial western music notes but Laxmikant insist it will add extra taste in this semi classical song and rest is history. Weird. Which platform are you on? Anyone else having the same problem? Thank you for sharing this nice soundtrack. This link worked perfectly. Many thanks for your prompt response. Cool. Are you on a Windows PC? There was a slash (/) in the original folder name which Windows might have problems with; had the same issue on a download many years ago too. You'd think Microsoft would have learned how to handle a slash by now; perhaps not. So Windows users, use the above link, not the top one. Thanks a million sir, yes I am on a Windows PC & the new link worked a treat. Many thanks for such a swift response & all the best for continued success with your unique blog.